An eco-tour for local residents was organized on February 1, 2014, in celebration of World Wetlands Day (February 2; this year’s theme: Wetlands and Agriculture). A total of 21 people attended the tour and visited Tsurui Village to learn about the relationship between Red-crowned cranes inhabiting the Kushiro Wetland and agriculture. 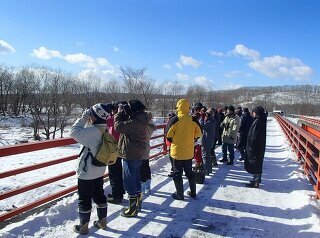 Guided by Mr. Kunihito Otonari, the head of Tancho Community (a local Japanese crane conservation group), attendees observed wild cranes at a winter feeding site and viewed their nests in the river before visiting a farm near the Kushiro Wetland, where dairy farmer Mr. Hidetatsu Fujiwara gave a talk about cranes arriving at the property. Against a background of Red-crowned cranes walking on the farm, he pointed out that although these birds are a national natural treasure and popular among visitors, they are problematic for farmers because they damage fields and enter barns to steal cattle feed. 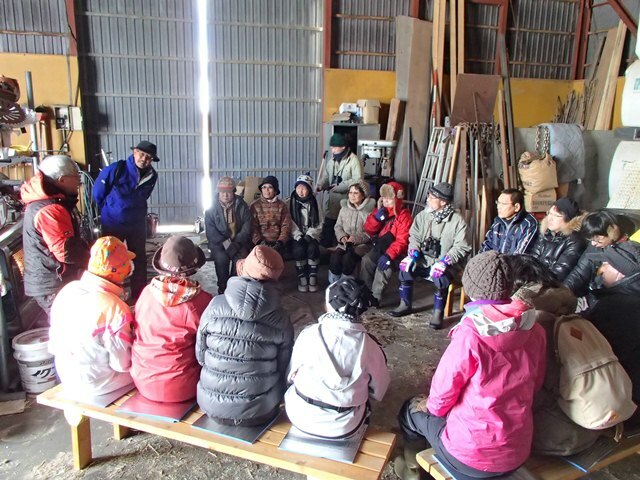 Then the group made crane feed (an activity promoted by Tancho Community to connect farmers and cranes) by separating specially cultivated dent corn, and deposited it at a feeding site with message cards from all participants. Problems caused by cranes are not limited to agricultural damage; they also collide with electrical wires and cause other issues. However, most people on the tour were unaware of these problems. For such people, the experience was a first step in considering harmonious coexistence between humans and cranes in their role as a symbol of the Kushiro Wetland.